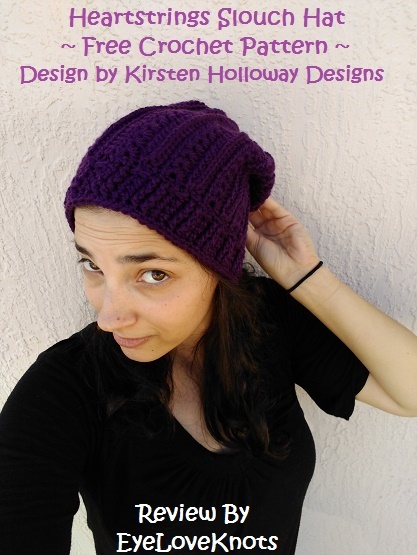 I pattern tested this for Kirsten of Kirsten Holloway Designs, and it was a lot of fun! It features a line of star stitches that turned sideways create rows of small hearts – something I did not realize before beginning the pattern, but learned afterwards was the intention. I was intrigued by the texture and addition of the star stitch, and was quick to volunteer for it. There’s also some matching Heartstrings Fingerless Gloves – another free crochet pattern! Are you a raveler? 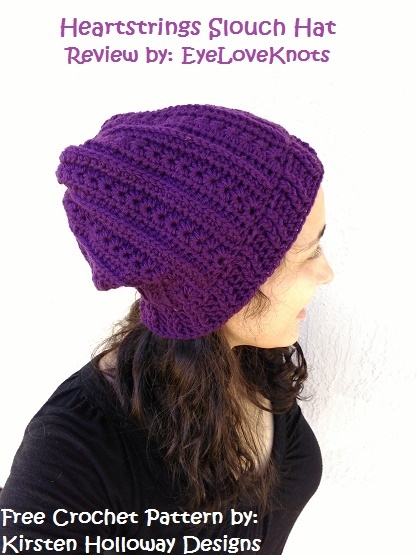 If so, make sure to favorite this Heartstrings Slouch Hat and link up your project to it! 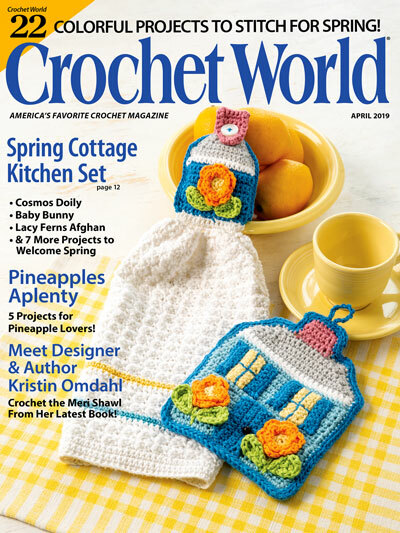 Pattern calls for worsted weight yarn. Red Heart Soft used in original pattern. I had my hat finished in just over four hours. Finished measurements are 10″ across (20″ in circumference) by 9 3/8″ tall. Working in pattern and before brim and sewing, my piece measured 8″ (shorter than should have been, but perfect for me). I settled on the 5mm hook for my piece, though I think with an I9/5.5mm hook, I probably would have been able to get to the 8.5″ length stated in the pattern and the hat would have had more drape and flexibility. I do think the 8″ length worked out perfectly though as I don’t like my slouches to be too long, or else I think the ends tend to sit a little funny. From this length you’ll gain some extra with the brim. When working the Row 2’s, I worked the beginning and end stitches into the actual stitch, not the 3rd loop to keep my edges straight and consistent. To help keep my edge straight, when I worked the Row 3’s, I added a yarn over after the initial chain, and omitted the second stitch which works into the side of the stitch. Worked wonderfully. I just wanted to also point out in Row 3 (even though it’s stated in the pattern), there is no chain 1 after the last star as the half double crochet creates an equal space, and secures the star. It is very easy to mistakenly add one there, and then the row will not form correctly. In reference to Row 5, I don’t like the uneven edge by working into the last stitch, rather than the chain. 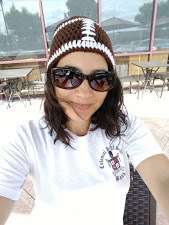 Personal preference – I worked the last stitch into the chain. To reach the desired 20″ length, I worked 12 repeats plus the original making 13 total. With working these repeats, I worked Round 1 of the Brim as 6 stitches in the first repeat, 5 in the next, 6 in the next, 5 in the next… around. Worked out perfectly. In the seaming process, I turned my hat to the wrong side before sewing up the side. This isn’t really necessary when using the whipstitch, but I think it hides the seam better. Here’s where I made my mistake… I went right from sewing up the side, to closing up the hole. In the testing process I did not know that the stars were supposed to be hearts so I wasn’t looking for it, but in the published pattern it’s emphasized so just make sure you pay attention to which end you close up as the top. Either way, the hat still looks great so if you do do them upside down like I did, it’s really no big deal. To sew up the top, I worked from the wrong side, and weaved my needle in and out of every other stitch along the top. Once back to the beginning, I pulled it closed, and sewed to secure. In reference to the brim, working a post stitch already shortens the length of the stitch. I did start by working the brim as written, but I just didn’t like how the brim was bunching and didn’t have as much flexibility. 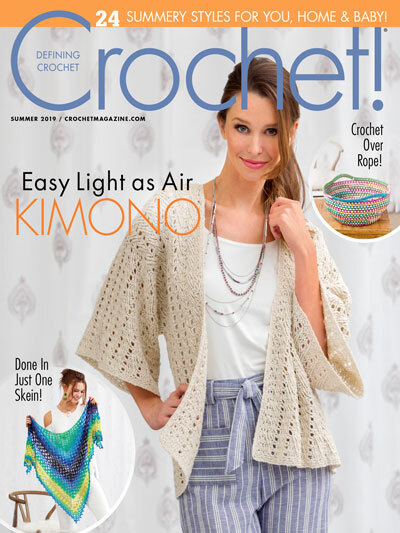 Usually, and in this case too, I worked each post stitch as a double crochet, and worked the regular stitches as half double crochets. This helps create a nice even piece with nice stretch. As mentioned before, I ran out of yarn working on Round 5 so to finish off my hat, I ended up working through Round 4 as written, and then worked a final round of single crochets and fastened off. Because I ran out of yarn, I did not work or test the button tab. I like how my hat looks without it, but think the hat looks even better with it, especially with that pretty flashy button that Kirsten used! You could experiment with a different color just for the brim, and then make the tab the original color, or make the tab with a different color. Find some fun, elegant button to attach – could take a trip to your local thrift store in search of a vintage button or even try your hand at making one out of clay or tree branch! The pattern was fun, and simple but looks elegant and more complex. I love the mix of stitches, and the fit is great. I was a little worried that with the extra bulk in the top of the hat that it wouldn’t sit right, but I wore the hat around all day, and didn’t run into any issues – and it received many compliments. Aside from this hat (and the matching gloves found in the introduction), I think this stitch combination would be perfect for a cowl, scarf, wrap, blanket, placemats, table runner, skirt, blouse… Just to name a few. Feeling adventurous? What would you make to match? With so many size, yarn type and color options, I would love to see them! Join the EyeLoveKnots Crafting Community to share your creations, and see what other’s are up to! or our latest Yarn Fanatic Party Link Up! Don’t Crochet but Interested in Purchasing a Heartstrings Slouch Hat? Visit the EyeLoveKnots Etsy Shop to see what I have available! Use the search box to type in what you have in mind, or feel free to send me a message with your custom request. I am happy to make in any custom size and/or color. View color options here: Everyday Soft. I, too love the mix of stitches! Looks lovey. Great colour. Thanks for joining us at Creative Mondays.